Earwax is made up of long-chain fatty acids, squalene and alcohols that provide a waterproof lining preventing infection, among other things. The purpose of earwax is to protect the hollow hole that is our ear canals from bacteria and debris. Earwax is our body’s way of keeping the bad stuff out of our ears and trapping dead skin cells. With the help of wax, our ears stay clean, healthy and functional. The doctors at the American Academy of Otolaryngology – Head and Neck Surgery do not recommend the use of cotton swabs or any other foreign objects as ear-cleaning tools. Before anyone reaches for a cotton swab, it’s important to know how to safely clean your ears. 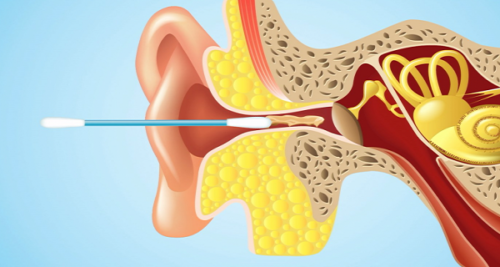 A cotton swab should never be inserted into the ear canal. In fact, your ears have their own way of self cleaning by pushing out wax on their own. Sometimes this can cause earwax to build up on the external part of the ear, which can be gently cleaned using a cotton swab or wet cloth. Wax that is soft and yellow in texture most often belongs to children. It is normal and healthy for children to produce a lot more earwax than adults. As children grow older, they will produce less. Wet and sticky yellow earwax is one of two common varieties of cerumen found in most people. The wet and sticky texture is especially good at lubricating the ear canal, which prevents them from being dry and itchy. Dark earwax is indicative of the way your body releases sweat. The darker in color it is, the more likely you are to have a chemical in your sweat that’s linked to your ability to produce body odor. People with darker earwax have a tendency to produce more body odor than people with lighter wax. However, both varieties are perfectly healthy. White, dry, flaky wax is the other most common type of wax found inside your ears. This variety of cerumen is linked to a recessive gene. In turn, this color of earwax is usually seen in people who produce less body odor. Apocrine glands inside your ears are what produce wax. When you are stressed or afraid, these glands react by producing more wax than normal. It’s a similar reaction to sweating under pressure. When earwax produces at a faster rate than your body can naturally push it out of the ear canal, a wax buildup can occur. Too much earwax can cause a blockage, leading to temporary hearing loss. While black or very dark brown wax is scary looking, it is probably no cause for alarm. Dark earwax could be a sign of the overproduction of wax from stress as mentioned above. It is also a sign that it has been in your ear for a while. The fats in your earwax react to oxygen, causing the substance to darken. The longer the wax is in your ear canal, the more oxygen it’s exposed to, leading to a darker hue. It is normal for older and darker earwax to have a similar appearance to blood. However, it could also be an indication of a ruptured or perforated ear drum. To be safe, it’s best to see a doctor immediately. It is normal for ear wax to leak from the ear canal from time to time in small degrees, as this is your ear’s natural cleaning mechanism. However, large volumes of drainage with blood and pus in them is a sure sign of a ruptured or perforated ear drum. If your earwax is usually the wetter, stickier type, but you notice it’s looking gray in color, it is likely the result of dust build up. The gray might look unusual, but it’s just a sign of earwax doing its job by protecting your eardrum from foreign objects. On the other hand, if the gray wax is accompanied by cracking, dry or itchy skin inside the ear canal, it could be seborrheic eczema. A doctor can provide treatment in this case.